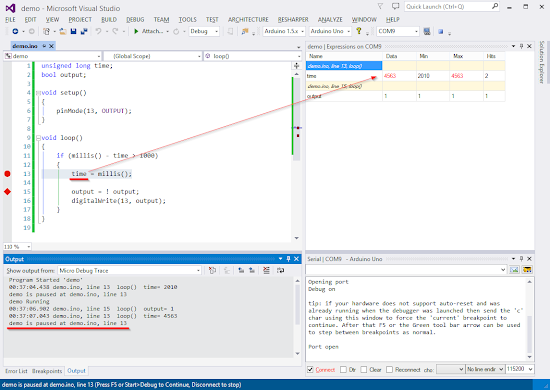 Visual Micro is very an interesting extension for Microsoft Visual Studio (it works also in Atmel Studio). It allows you to program Arduino directly from Visual Studio environment – that’s cool, but that’s not all! Debugging AVR processor requires dedicated external HW debugger, which is pretty expensive gadget. So Visual Micro is not true debugger but still, fairly awesome. Visual Micro utilize technique called Instrumentation. When you start debugging in VS, Visual Micro takes your code and inserts small pieces of its own code into it. First is at the beginig of setup() and next to everywhere where breakpoints are. The magic happens when Visual Micro takes this cryptical lines and visualize it nicely in Visual Studio. And that’s what you are paying for. Visual Micro with Debugger is not for free. The instrumentation is fairly simple, but the integration into Visual Studio is more difficult part. Price starts at $29. But it’s worth it. 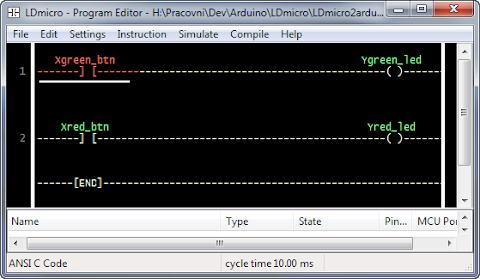 In this article the way how to run program in ladder logic from LDmicro on Arduino is presented. LDmicro is free SW to write and simulate ladder logic programs. When is ladder logic program is successfully simulated it could be compiled for AVR or PIC processor. However ATmega used in Arduino is not supported. 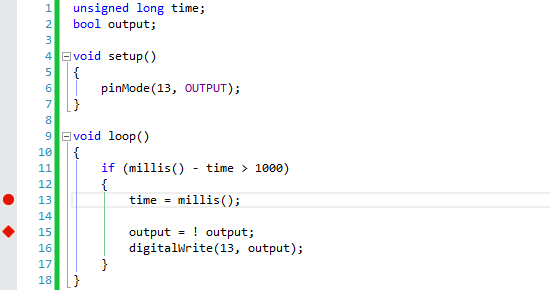 Fortunately LDmicro can “compile” code into ANSI C. So, let’s take a look how we can run this code on Arduino. And similar to others input and output pins. Actually we have to write the layer between leader logic program and real HW of Arduino. And it could be more than simple call of digitalRead or digitalWrite. For example we could control servos, read data from proximity sensor and so on. Ability to write this layer is very powerful. Ladder logic could be used for core logic of application and C only for HW layer. For more information read actual generated C file. It contains more information. If we need just direct control of digital IO pins of Arduino ladder.h could be easily generated for us. I wrote PHP script that can do this job. It requires generated code and mapping between variable name we use in ladder logic and pin numbers of Arduino. It will generate ladder.h with all nessesary functions and setup function (correctly calls pinMode for all used digital pin). Script could be used as console application or it’s also available online. Let’s do it step by step. Complete example is available for download. 1. Write code in LDmicro. 2. Select as Microcontroller “ANSI C Code”. 4. Prepare mapping for IO pins of Arduino. Its text file called pinmap.ini. See example for details. 5. Generate ladder.h file by ladder-gen.php. Tip: Ladder.h generator is available also online. However you can’t use pinmode.ini in online version. So all input and output pins have to have name “d0” for arduino digital pin 0, “d1” for pin 1 and so on. See example for better sketch implementation (this one is for illustration and it's not accurate for timers). 7. 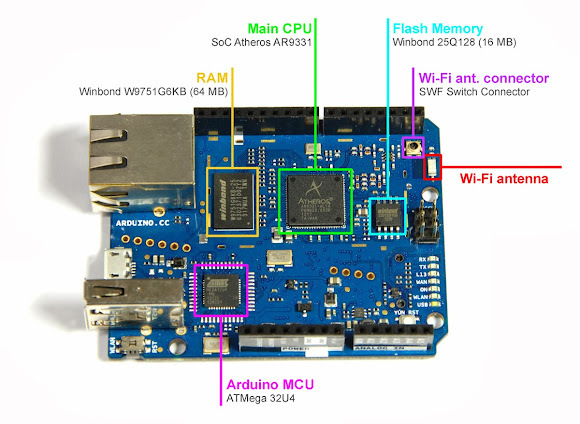 Compile it by Arduino editor and upload it. Tip: Now if you enable “External editor” setting of Arduino editor then you need just hit “F5“ in LDmicro and then push “Upload “ in Arduino editor to run program. I hope presented method will help you start with ladder logic for Arduino. If you have any suggestion or find a bug in script, let me know.